The insect collection is known as the Hope Entomological Collections after its founder the Revd. F W Hope, who – alongside Ellen Hope and the first Hope Professor of Zoology, J O Westwood – established the collections and their global reputation in the late-19th century. The collection is second in size to the Natural History Museum in London, with an estimated five million specimens and 20,000 type specimens. Most of the insect material is dry-pinned, with some slide mounts and spirit collections. The collection is particularly strong in historic material and associated archives, and contains specimens from eminent entomologists such as H W Bates, Count C J Billberg, W J Burchell, P F M A Dejean, D Drury, J C Fabricius, W Kirby, F P Pascoe and F Walker. In addition to the historic material, there are important research collections from University academics and past curators, such as E B Poulton’s Mimicry Collection, H B D Kettlewell’s breeding experiments and the Wytham Collection of C S Elton and G C Varley. Some of the highlights of the collections include Livingstone’s tsetse fly, Australian insects collected by Charles Darwin, and several thousand specimens including numerous types collected by A R Wallace in the Malay Archipelago. 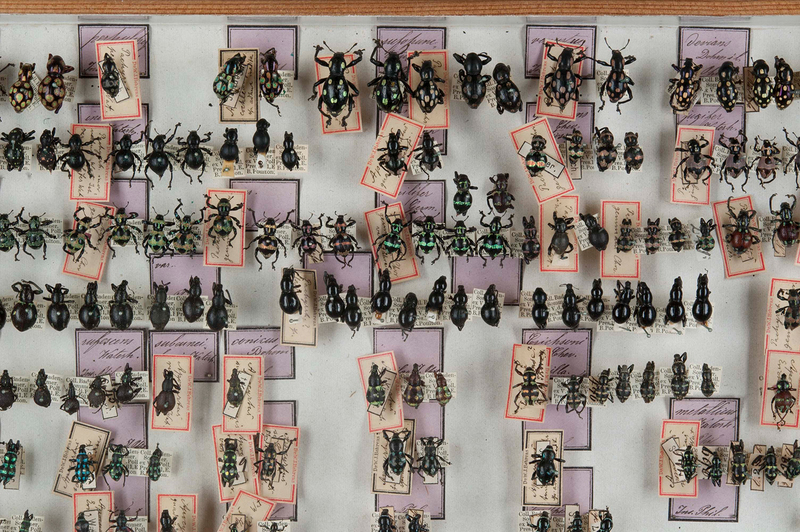 The British Collection of about one million specimens spans the history of British entomology, with insects from the 18th century to the present day. The collection is particularly strong for flies, bees, beetles and true bugs. Highlights include the H St. J C Donisthorpe Windsor Forest Collection, the J C and C W Dale early British collection, the Verrall-Collin fly collection, and the F J Killington lacewing and W J Lucas dragonfly and grasshopper collections used for their respective Ray Society monographs. Other well-known collectors include M Burr, H E Cox, A J Chitty, C D Day, G C Champion, D W H Fennell, E B Ford, A H Hamm, A H Haworth, R C L Perkins, F Smith and J J Walker. The small orders include the dragonflies, praying mantis, cockroaches, lacewings, grasshoppers and allies. The collection is strong in historic material and includes the mantis collection from Westwood’s Revisio Insectorum Familiae Mantidarum. The cockroach collection is one of the richest in the world, and includes numerous types of R Shelford and K R Hanitsch. Other highlights include M Burr’s Palaearctic collection and material from C Brunner von Wattenwyl, K Branscsik and S A Neave. The type specimen of the cockroach Melyroidea magnifica collected in Ecuador, described by Robert Shelford, who was one of the leading cockroach experts of all time. The Hemiptera (true bugs) collection's strengths are the D Leston world shield bugs and their allies (Pentatomoidea), the G B Buckton Membracidae specimens and the world aquatic bug collection. The Platanus lace bug Corythucha ciliata. A potential pest of UK trees, but not yet established. The Coleoptera (Beetles) collections are particularly strong for historic specimens and types, in particular those of F W Hope and J O Westwood. Highlights include the T V Wollaston Atlantic Islands collection, the L A A Chevrolat and J A A H Putzeys ground beetles (Carabidae) and the longhorn beetles (Cerambycidae) from Baden-Sommer, including types of several contemporary authors. The cyan dung beetle (Gymnopleurus cyaneus) from Sri Lanka. The Diptera (flies) collection contains numerous types and historic material as well as important predator-prey collections amassed by B M Hobby and A H Hamm. Most significant is the Verrall-Collin Collection, which contains over 140,000 flies and includes material not only from G H Verrall and J E Collin, but also other important European dipterists such as F Kowarz, H Loew, J M F Bigot and J P M Macquart. The dance fly (Empidoidea) collection is one of the most comprehensive in Europe, featuring the material of J E Collin and M Chvála. The antler fly (Elaphomyia alcicornis) from the Bigot-Macquart historic fly collection. The Hymenoptera (bees, wasps and ants) collection is particularly rich in bees, containing the world’s largest known bee – collected by A R Wallace – as well as recent collections made in the Mediterranean and Middle East. Significant early 19th-century bee collections include those of A L M Lepeletier and P A Latreille. Notable collections include the world ant (Formicidae) collection of W C Crawley, the world Hymenoptera collection of W W Saunders, which contains many species collected by A R Wallace and described by F Smith. The Hymenoptera collection also includes specimens collected by C G Nees von Esenbeck (Chalcidoidea and Prototrupoidea), F D Morice (Tenthredinidae and Aculeata) and G A J Rothney (Indian Hymenoptera). The original specimen of Wallace's giant bee Megachile pluto, described by Frederick Smith, one of the UK's leading melittologists of the 19th century. The Lepidoptera (butterflies and moths) collection contains many unique and historic specimens, including the world’s oldest pinned insect – a bath white butterfly dating to 1702. Soon after opening, the museum amassed many thousands of butterflies and moths collected by Victorian naturalists and explorers such as A R Wallace and H W Bates. In the early 20th century, a large number of specimens were added to the collection and used as model organisms in the study of genetics and evolutionary processes such as mimicry and natural selection. Notable collections include the moths of W W Saunders, which contain many species collected by A R Wallace and described by F Walker. The Lepidoptera collection includes also the African butterflies from E B Poulton and G D H Carpenter and the J J Joicey butterflies from New Guinea. Male Queen Alexandra's birdwing (Ornithoptera alexandrae), one of the world’s biggest butterflies, donated to the Museum by the well-known Lord Walter Rothschild.